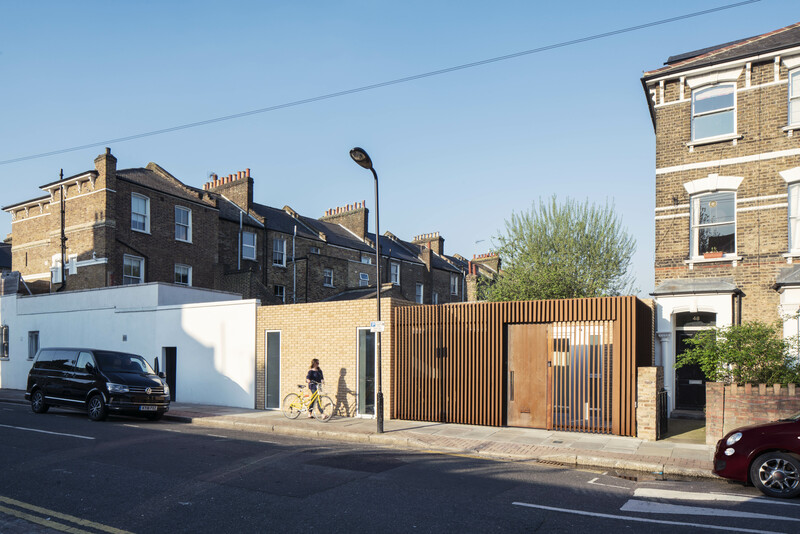 A new family home for a constrained back garden site in a Hackney Conservation Area, formerly occupied by a run-down garage and workshop. 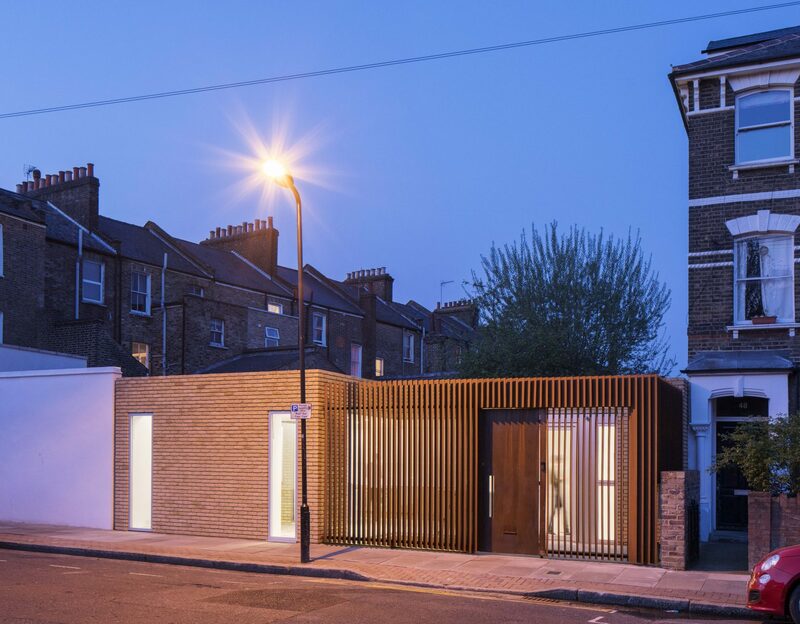 Our brief was to design an imaginative and engaging contemporary home for the small site, measuring only 11m by 8m, whilst sticking to a volume established by a historic planning application. 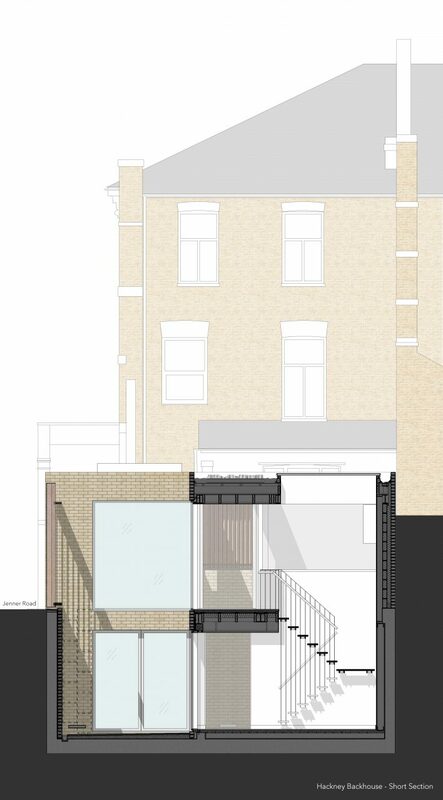 Working within the very tight constraints of the site, planning requirements and the previous permission we worked with our client to develop a new approach to the project and gained planning permission in June 2016. 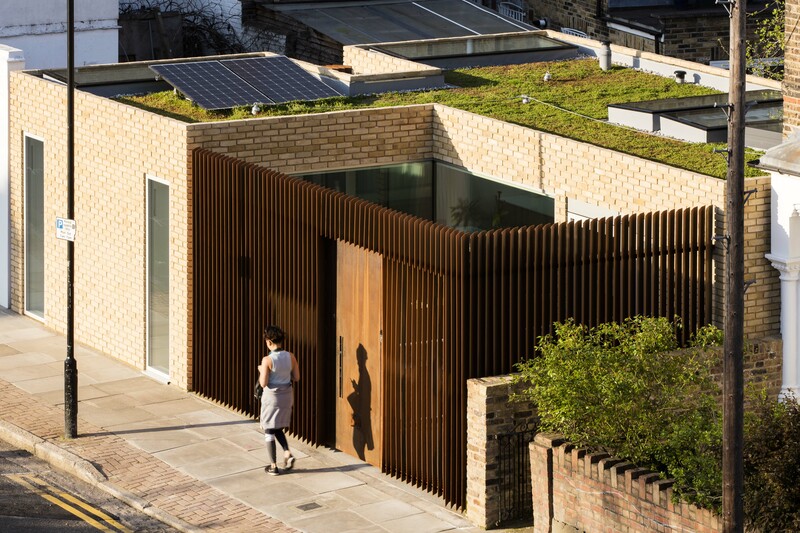 We started by re-thinking the relationship between the house and the street, reversing the typical approach for back garden houses in London Conservation Areas, that are often placed behind a wall and so turn their back on the street. By removing any visual connection with the street such houses feel disconnected and confined. 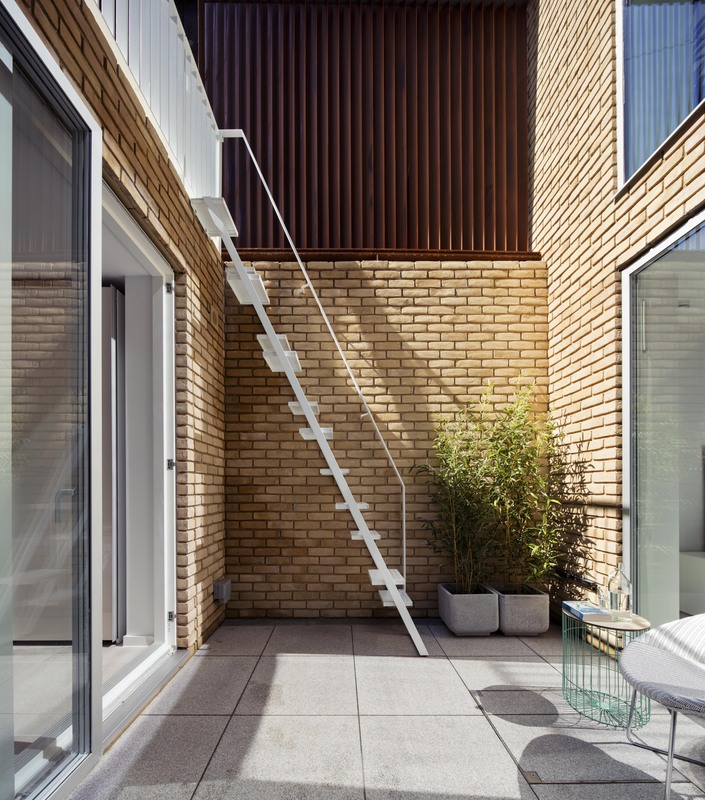 Instead, we designed the house to have a direct visual connection with the street, views in and out of the ground floor living spaces and basement bedrooms being carefully manipulated with louvred screens of weathering steel. Due to the detailed design of the screens, passers-by are offered no more than a fleeting glimpse into the house whilst the residents enjoy the views and additional daylight that wouldn’t be possible if the house was positioned behind a wall. 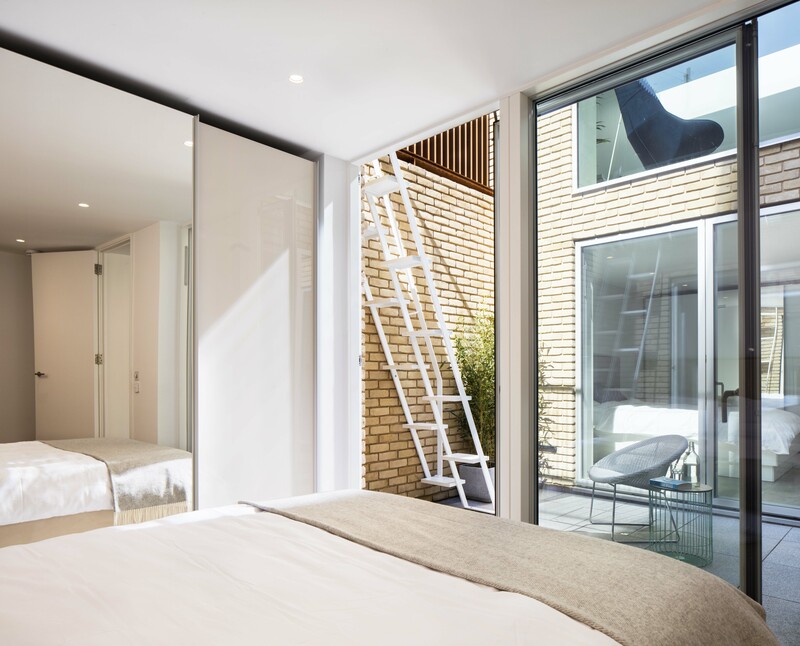 The screens also allow floor-to-ceiling glazing to be used without the need for curtains or blinds to provide privacy. 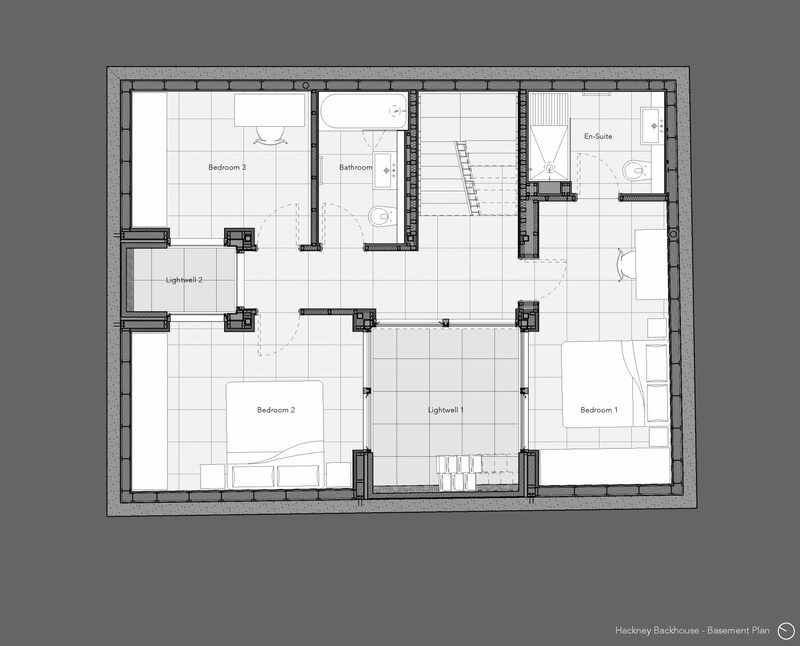 The three bedrooms and two bathrooms are in the basement of the house, enjoying ample daylight because they are arranged around external courtyards which gain additional light through the privacy screens. 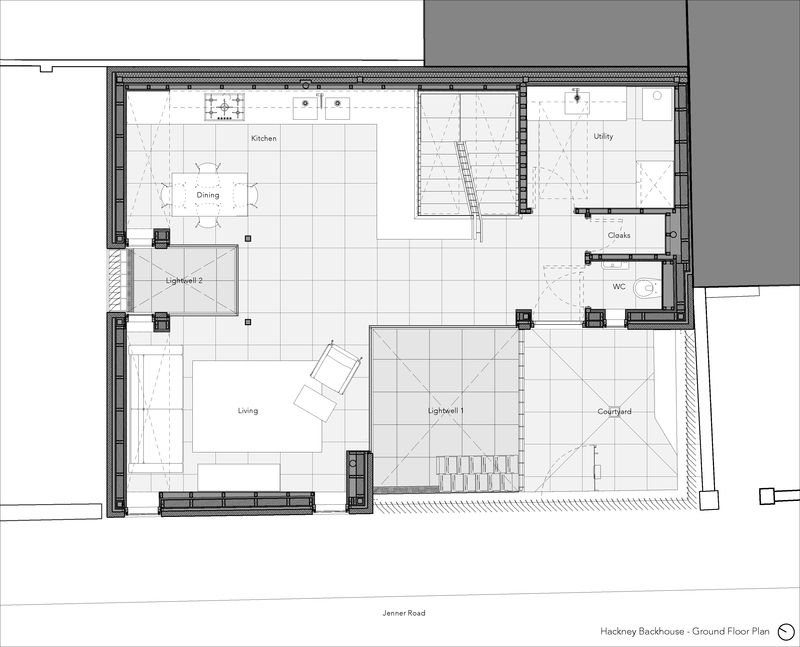 The courtyard spaces also provide vital external amenity and cycle storage space. The house has a refined materials palette of ochre brickwork, anodised aluminium windows, weathering corten steel, concrete floor tiles and both oak and white joinery. Tactile fittings such as handles and handrails are picked out in brass. The house has been designed to be extremely low energy, with photovoltaic solar panels, triple glazing, super-insulation and underfloor heating. A sedum green roof reduces water run-off from the house which fills the entirety of the plot. 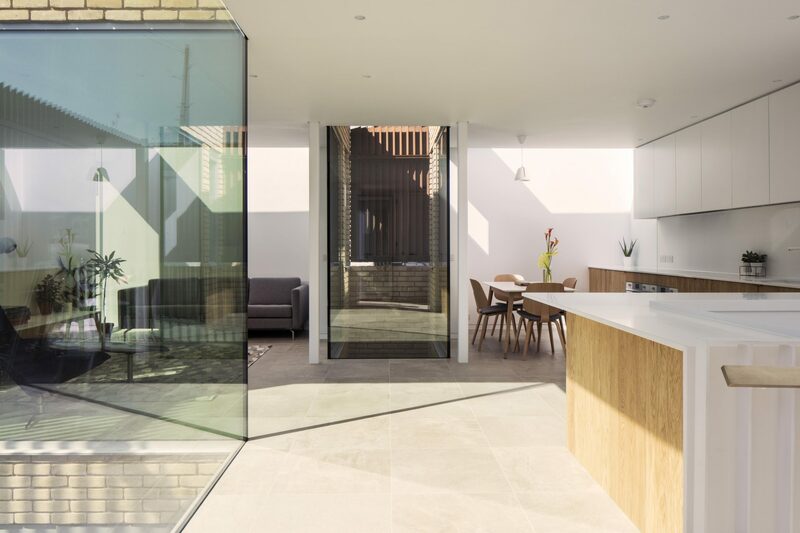 “We had conversations with many architects when we started preparing for our first new build but when we met Fred we were confident he had the qualities to make our project outstanding. He immediately set about understanding our ideas and requirements, although as a novice I wasn’t able to offer absolute clarity on some of them. In spite of this he was able to decipher them and give them back to me as clearly as if he had read my mind. This for me was the stamp of an exceptional architect. Throughout the project he displayed absolute professionalism, great organisational skills, a strong work ethic and a very keen eye for detail. Early on, whilst dealing with the planning department, I feel they were happy to work with him and were responsive to him because of his excellent design ideas, how well he prepared for meetings and the attention to detail in his drawings. Having gained a new planning consent, Fred produced a very detailed tender document, found an excellent builder and had detailed and measured everything with precision which allowed the work to go ahead smoothly and without delay. His clear communication ensures a high quality of work and he follows through on all issues to maintain that high standard of finish. His foresight allows him to make solid recommendations which come from his experience and his logical approach. He thinks beyond the scope of the initial project at hand and has a grasp of the bigger picture which derives from his passion for his work. His passion for his work is self-evident in all the dealings I have had with him. I was also taken by his ability to deal with everyone from builders to planning officers to neighbours. He has a calm, polite and definite manner which puts everyone at ease. His ideas created that spark needed to make the building more than just a functional space and he gave new insight into the best use of materials. 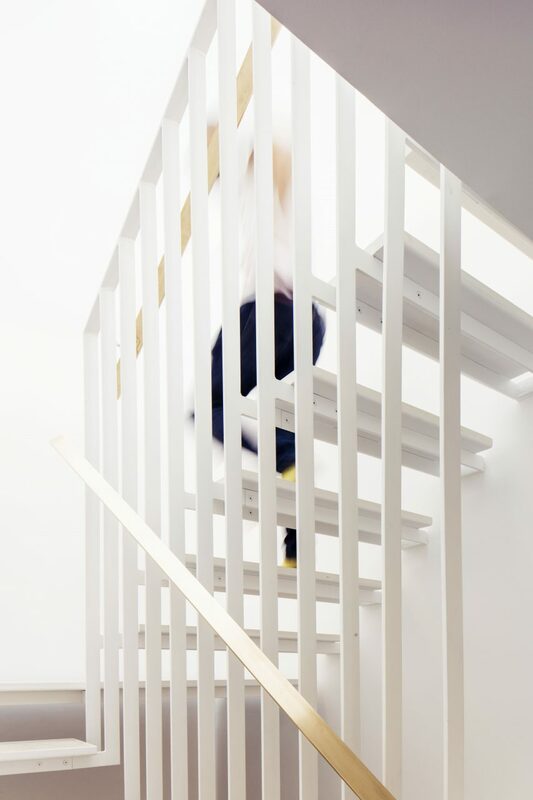 His design ideas, whether for the kitchen, interior stair or fire escape stair, all go to making the house stand out. 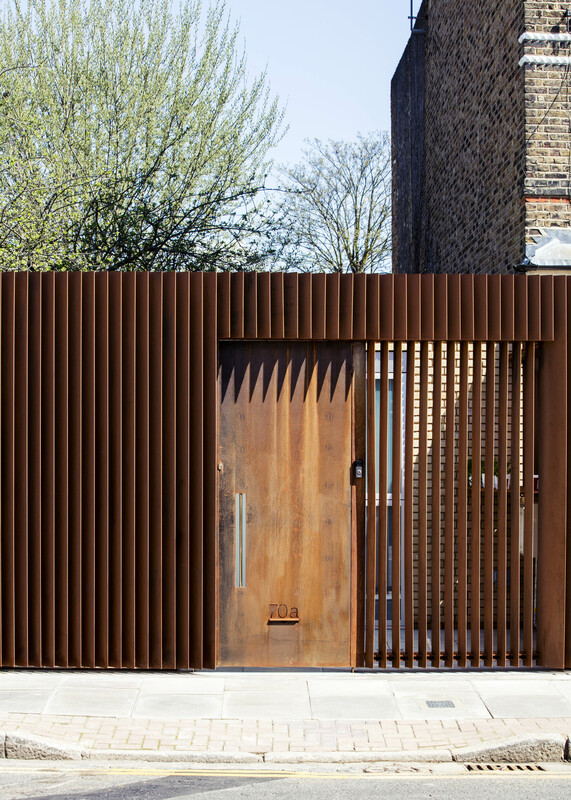 In particular, the external louvred Corten which allows more light to permeate to below ground level, has a wonderful aesthetic appeal and is admired and commented on by many people passing by.